The pitot tube is utilized to measure the total combined pressures that are present when an aircraft moves through the air. Static pressure, also known as ambient pressure, is always present whether an aircraft is moving or at rest. It is simply the barometric pressure in the local area. Dynamic pressure is present only when an aircraft is in motion; therefore, it can be thought of as a pressure due to motion. Wind also generates dynamic pressure. It does not matter if the aircraft is moving through still air at 70 knots or if the aircraft is facing a wind with a speed of 70 knots, the same dynamic pressure is generated. When the wind blows from an angle less than 90° off the nose of the aircraft, dynamic pressure can be depicted on the ASI. The wind moving across the airfoil at 20 knots is the same as the aircraft moving through calm air at 20 knots. The pitot tube captures the dynamic pressure, as well as the static pressure that is always present. The pitot tube has a small opening at the front that allows the total pressure to enter the pressure chamber. The total pressure is made up of dynamic pressure plus static pressure. In addition to the larger hole in the front of the pitot tube, there is a small hole in the back of the chamber that allows moisture to drain from the system should the aircraft enter precipitation. Both openings in the pitot tube must be checked prior to flight to ensure that neither is blocked. Many aircraft have pitot tube covers installed when they sit for extended periods of time. This helps to keep bugs and other objects from becoming lodged in the opening of the pitot tube. The one instrument that utilizes the pitot tube is the ASI. The total pressure is transmitted to the ASI from the pitot tube’s pressure chamber via a small tube. The static pressure is also delivered to the opposite side of the ASI, which serves to cancel out the two static pressures, thereby leaving the dynamic pressure to be indicated on the instrument. When the dynamic pressure changes, the ASI shows either increase or decrease, corresponding to the direction of change. 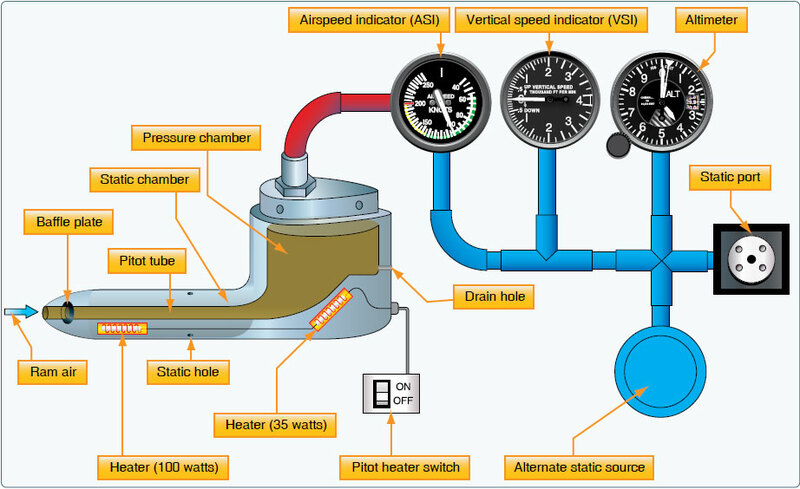 The two remaining instruments (altimeter and VSI) utilize only the static pressure that is derived from the static port. The static chamber is vented through small holes to the free undisturbed air on the side(s) of the aircraft. As the atmospheric pressure changes, the pressure is able to move freely in and out of the instruments through the small lines that connect the instruments to the static system. An alternate static source is provided in some aircraft to provide static pressure should the primary static source become blocked. The alternate static source is normally found inside the flight deck. Due to the venturi effect of the air flowing around the fuselage, the air pressure inside the flight deck is lower than the exterior pressure. The altimeter indicates a slightly higher altitude than actual. The ASI indicates an airspeed greater than the actual airspeed. The VSI shows a momentary climb and then stabilizes if the altitude is held constant. Each pilot is responsible for consulting the Aircraft Flight Manual (AFM) or the Pilot’s Operating Handbook (POH) to determine the amount of error that is introduced into the system when utilizing the alternate static source. In an aircraft not equipped with an alternate static source, an alternate method of introducing static pressure into the system should a blockage occur is to break the glass face of the VSI. This most likely renders the VSI inoperative. The reason for choosing the VSI as the instrument to break is that it is the least important static source instrument for flight.